We are often asked how you can share your bonded Speedify connection with other computers in the same office (or backpack!). The easiest way to accomplish this is to use a Windows computer running both Speedify and Connectify Hotspot MAX. If you have multiple people attempting to work over a single Speedify connection, we strongly recommend the use of a Dedicated Server. Dedicated Servers get you the guaranteed bandwidth (and static IP address) that you need for your work-related internet connection. You have one Windows PC running both Connectify Hotspot MAX and Speedify. This box is referred to as the "Bonding PC." 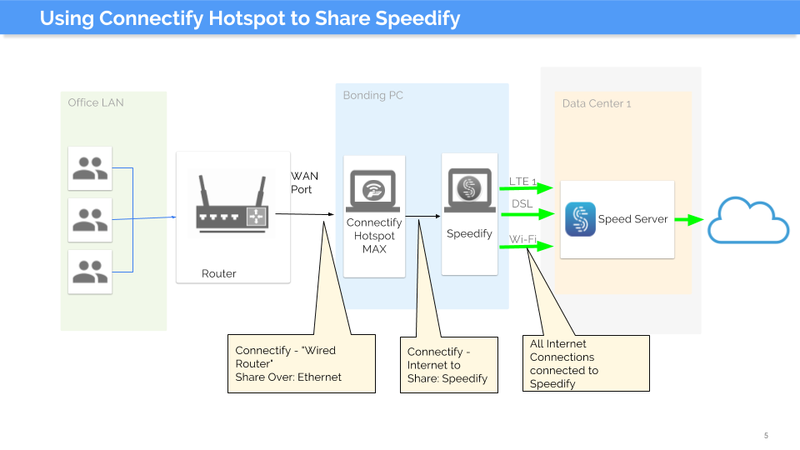 All of your internet connections are connected to the Bonding PC and bonded into a single virtual connection by Speedify. 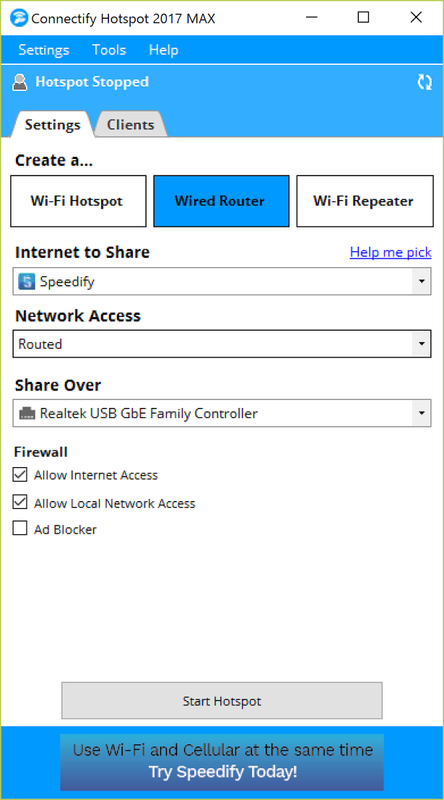 Connectify Hotspot MAX then shares that bonded connection with the rest of your network, over an Ethernet card that is not one of the internet connections. Connectify Hotspot includes a NAT to making the bonding PC into a real router. If your network is small and simple, you may only need a simple Ethernet switch to connect your other computers. If you have a more complex network, you can use a full-featured router to run the network. But in this case, you must connect the Ethernet from the Connectify Hotspot to the WAN Port of the router, not any of the client ports on the router. Connectify Hotspot MAX turns your computer into a real router. By default, it's a Wi-Fi router, but you can also select Wired Router to turn your computer into a wired Ethernet router. Install Speedify and sign in. Make sure all of your internet connections are connected and working with Speedify. To share as an Ethernet router you need to have one Ethernet card that is dedicated to the sharing and is not one of your internet connections. The Ethernet can be run directly to a client computer, to share with more computers you can connect it to the WAN port on router, or any port on an Ethernet switch (as long as it does not have another router on it already). In Connectify Hotspot's Settings menu, there is a "Startup Options." Adjust your power settings so that Windows will not turn off when unused. Windows Update will generally make you reboot once per week at a minimum.